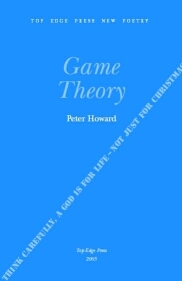 Game Theory is a pamphlet of poems by Peter Howard, published in 2005 by Top Edge Press. Peter Howard is an interesting poet who combines craftsmanship, knowledge and a deep love of words to make some excellent poems and this small pamphlet is packed with them. Price £4.50 including postage. Please send payment with order.